Birthplace : Fall River, Massachusetts, U.S.
George Stephanopoulos is an American television journalist and a former political advisor. Stephanopoulos is most well known as the chief political correspondent for ABC News the news division of the broadcast television network ABC and a co-anchor of ABC News's morning news program, Good Morning America (GMA). He was previously the host of This Week, ABC News's Sunday morning news program. He is the primary substitute anchor for ABC News's flagship news program, World News with Diane Sawyer. In recent years he has co-hosted ABC News's special live coverage of political events with Charles Gibson and Diane Sawyer, and has appeared regularly on GMA, World News, and launched "George's Bottom Line", an ABCNews.com blog. Prior to joining ABC News, he was a senior political adviser to the 1992 U.S. presidential campaign of Bill Clinton and later became the White House Communications Director for two years, before being replaced by David Gergen after political fallout from the historic mid-term election of 1994, in which the Republican party took over the U.S. House and Senate. George Robert Stephanopoulos, the descendant of Greek immigrants, was born in Fall River, Massachusetts, and grew up in Purchase, New York, and suburban Cleveland, Ohio. His father, Robert George Stephanopoulos, is a Greek Orthodox priest and Dean Emeritus of the Cathedral of the Holy Trinity in New York City, New York. His mother, Nickolitsa ("Nikki") Gloria (née Chafos) Stephanopoulos, was for many years the director of the national news service of the Greek Orthodox Archdiocese of America. As had his parents, young George became a follower of the Greek Orthodox faith; he had long considered entering the priesthood himself. 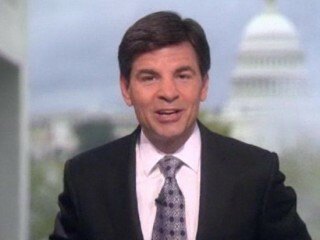 Stephanopoulos attended Orange High School, located in a suburb of Cleveland, Ohio. He wrestled competitively in high school. In 1982, he received his bachelor of arts degree in political science from Columbia University in New York, where he was a sports broadcaster for WKCR-FM, the university's radio station. While in college, he announced soccer games with current New York Mets Sportsnet New York announcer Gary Cohen. Stephanopoulos was the salutatorian of his class and was also awarded a Harry S. Truman Scholarship. Since Stephanopoulos's father had always wanted his son to become a lawyer, if not a priest, he promised his father that he would attend law school eventually. Initially he took a job with a congressman Ed Feighan from Cleveland, and served as an aide in Washington, D.C. Nevertheless, his father persistently questioned him as to when he would attend law school, so Stephanopoulos agreed to attend law school if he was offered a Rhodes Scholarship. Although he had been rejected for the scholarship during his senior year at Columbia, Stephanopoulos was successful in his second attempt. Stephanopoulos earned a master of studies in theology at Balliol College during his Rhodes Scholarship. He reported spending much of his time trying to root his political leanings in the deeper philosophies that he studied while at Oxford. He is married to Alexandra Wentworth, an actress, comedian and writer. The couple have two daughters Elliott Anastasia Stephanopoulos and Harper Andrea Stephanopoulos; the family lives in New York City. View the full website biography of George Stephanopoulos.